I usually am not one to spring for frivolous "luxury" items but I will confess to being a sucker for a high-quality wallet or billfold. After having too many cheap wallets deteriorate under the rigors of my relentless rump, I began carrying a Tumi wallet several years ago and have never considered another brand since. I love Tumi's combination of elegant styling, superb craftsmanship, and attention to detail. When I first noticed the availability of Tumi's new Treo case sometime in the past year or two, I was immediately intrigued. However, with an initial pricing of in the $50-$60 neighborhood, I passed on the Treo case as I am not a huge fan of belt-mounted devices of any type since I am not fond of attempting to mimic Batman and his utility belt. However, when perusing the Palm Accessories store recently for a few items for my new Treo 755p, I saw that the Tumi case had been marked down considerably in price. I decided to take the plunge and buy one. 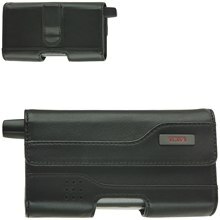 Encouraged from the free shipping promotion, I ordered the Tumi case from Palm's online store at a cost of $19.97. A ballistic nylon version with leather trim panels is also available at the same price. While Tumi's ballistic nylon is indeed a superb material (I own a messenger bag made out of the stuff! ), I prefer the timeless, understated elegance of leather since it matches my wallet. I also prefer black products, especially wallets and cases, whenever possible. My case arrived in an oversized cardbox box containing the case in a stylish black Tumi gift box. My initial expectations were already quite high! Overall, the packaging is perfectly befitting of the luxurious Tumi brand and its reputation as a purveyor of upscale leather goods. Definitely a 10/10 here! I am also pleased to report that Palm's online store seems to be processing and shipping orders a good bit faster than in years past. This is definitely an encouraging sign, especially as retail brick & mortar store availability of Palm products continues to dry up. I was pleased to find that Tumi has managed maintained most of the high levels of quality found in their primary products. Prior to conducting this review, I spoke with a salesperson at a local Tumi retail store and managed to find out that the Treo case is not an "official" Tumi product but rather a special product made for Palm. The continued absence of the Treo cases from Tumi's online store likely confirms this possibility. Whether or not this is true, this case definitely has unfortunately received less attention than the majority of the Tumi case and luggage line. While certainly better than 99% of the smartphone and PDA cases on the market, this case's full-grain, blemish-free leather did not appear quite as superb as the Nappa leather found in my past several Tumi wallets and billfolds. It had a faint but noticeable chemical odor and was not quite as soft to the touch. Nevertheless, this case does emanate a very high level of quality and craftsmanship in all aspects. Everything was exactly as promised, including the velour-lined interior compartment. Fit and finish, as well as all stitching are excellent, while the small metallic Tumi logo provides a nice, subtle touch. The generously-sized speaker cutouts keep the ringer from being muffled. Out of everything related to this case's construction, I was probably most pleased with the sturdy side panels and sturdiness of the top flap. I found no loose stitching upon my initial assessment nor has any thread come loose with heavy daily usage of the case over the past few days. I would like to see a 2nd generation of this case, perhaps with the option for a swiveling belt clip as well as a slim pouch-style case designed for pocket use along with the smaller Treo 680/750/755p formfactor. While I was expecting this when I bought it, my greatest complaint with the case remains its bulk. I am simply not fond of belt cases and find them to get in the way when doing any kind of overly physical activity as well as being awkward to wear when buckling my seatbelt or entering a vehicle. Despite there being some excess room around the smaller 755p vs. the old 700p, I still noticed that my keys were accidentally pushed while in the case Some might find reason to criticize the difficulty initial with removing the Treo from the case but I appreciate the extra security. I actually found it more cumbersome and aggravating to try to securely snap the flap closed with one hand while wearing it on my belt. I'd have preferred a larger, flat magnetic instead of the two small button-type magnetic closures. As it stands currently, at Palm's heavily discounted pricing and free shipping offer, owners of Treo 600, 650, and 700-series devices as well as the newer 680, 750, and 755p owners seeking an affordable but extremely high quality belt case should look no further. But with Palm's recent trend toward the smaller Treo 500 and Centro formfactors, it appears rather unlikely that we'll ever see an update of this fine case. After years of dangerous moves on the freeway as I dig for my Treo in my pants pocket so I can answer a call; dumping my pens, keys and change on the floor as I again try to dig the phone out to use it; or, finally, having the security guards at the mall stop me because of the huge bulge in my pants leg I've given up and started weawring my Treo on my hip. Yes, I've come out of the closet and joined thousands of other public Treo users proudly wearing their Treo's were all can see. Don't worry, Gekko, it wasn't as hard as I thought it would be. Remember we are all geeks at heart, just some of us hide it better than others.